Finally. Finished. I was worried about this book from the start as it was shortlisted for the Booker Prize, and I quite regularly don’t enjoy Booker Prize winners. But the blurb on the back made it sound so exactly like the sort of book I would enjoy reading. Famous author Olive Wellwood writes a special private book, bound in different colours, for each of her children. In their rambling house near Romney Marsh they play in a story-book world – but their lives, and those of their rich cousins and their friends, the son and daughter of a curator at the Victoria and Albert Museum, are already inscribed with mystery. Each family carries its own secrets. How delicious, I thought. And set in the 1890s, building up to the first world war. A tale of paradise, being slowly lost. Sweet nostalgia! I just couldn’t wait. But then I started it. 209 pages in, I appealed to friends on Facebook as to whether it was worth continuing. The verdict was split between those who absolutely loved it, and those who gave up. So I persevered, limping through all 616 pages to the end. 616. With very small font. 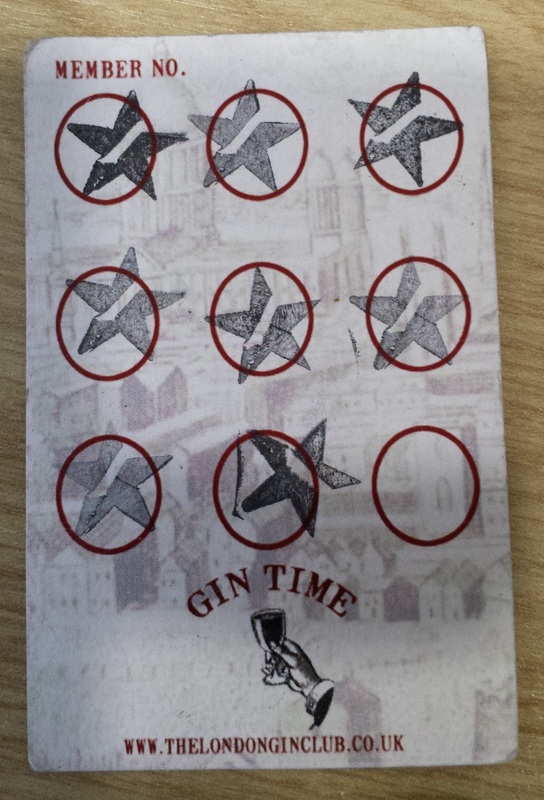 I should have known I would struggle when I found my Gin Club stamp card in it, which I had clearly been using as a bookmark last time I tried. I think one of the challenges of this book is there are about 20 main characters, which means that for the first 200 pages you don’t really know much about any of them, and consequently don’t really care. There is a scene early in the book where a lot of them are invited to a party solely, it seemed, so that you could have a paragraph introducing them all. It felt a bit clunky to me. Later on there were moments where the book came to life. Fleeting chapters that I thoroughly enjoyed. But they were surrounded heavy-handed dollops of history, endless descriptions of pottery and glazing, and so many fragments of children’s stories you felt that they should have just attached another book containing them all. I have to admit that I have never been moved by a pot. The nuances of glazing leave me cold. Perhaps if you are a pottery aficionado this will be full of fascinating nuggets, but if not, then brace yourself for a lot of pots. In fact, one friend commented in response to my Facebook appeal “It’s the one with all the pots in, right?”. That’s how much they feature. The ONLY THING she could remember were the pots. I definitely had a glazed look in my eye by the end. The book flirts with the Fabian movement throughout. At the start of the book this is introduced with characters being involved with the movement in some way, which is actually interesting, but by the end there are just whole pages updating you on what is happening in the Fabian movement even though it isn’t affecting the characters at all. I can’t help but feel that if I wanted a history of the Fabian movement, I wouldn’t go to a fictional account. The joy of historical fiction should be that it brings to life the history, not reporting it like a textbook. One thing this book does really well is to chart the early stages of the women’s movement. I think it captures beautifully the different attitudes and responses of both women and men. It also captures the challenges women faced in this era in becoming educated, how vulnerable they were to pregnancy and the difficult choices they had to make. What I think it does really well is show some of the murkiness of the movement too. We have the sinister Herbert Methley on stage speaking about things like how women’s clothing is a form of oppression and confinement and how “duty is a word that too often acts like restraining magic, to make a woman deny an important part of herself”, but at the same time over the course of the book he impregnates three of four women, thereby ruining their chances to do anything with their lives. We also see the differing reactions of the women in the book, with some clearly feeling no sense of agency at all, while others, like the painfully sensible Dorothy, deciding to challenge the established order and study, learn and take up professions. And we see how the Fabian and Suffrage movements intertwined, and didn’t. Stories are riddled throughout these books. The matriarch, Olive, is moved to write by significant events within the book, but I never felt that these added much to the narrative. They played to the sense of Fabian nostalgia, I suppose, but not enough to warrant the space they took in the book. The endless descriptions of the puppets were, I suppose, also meant to be magical, but it didn’t resonate with me. There are a few nice comments about readers and writers which, I suppose, I do agree with. But then there was this little excerpt about what a good book should do, and I just never felt it with this book. Ultimately the stories lead to suicide of one character, which shows, perhaps, the danger of making the private public. Family is another theme that in this book which ties in most strongly with the stories. Over the course of the book I entirely lost track of who was related to who as marriages, infidelities and relationships drew this group of people ever closer together. It questions our responsibilities to ourselves, to our siblings and to our children, and it also queries where the line of friendship and relationship lies. There is definitely a question in the book about when we grow up, and the children’s stories continue to be written into their adulthood to illustrate this. And this sense of nostalgia builds as we head towards the war with childhood taking on an important role throughout this book. Edwardians looked back to a Golden Age of Victoria, and had a consequent fierce nostalgia for childhood. Fabians saw that children were people, in a way previous generations had not. Importance of play for children was a new Edwardian idea. Then there is the character Tom, whose life exemplifies the dangers of not growing up. At first I thought there was a lack of driving plot to this book. Everyone seemed to just drift. Looking back by the end of the book, there were clearly some interesting plotlines, they just developed slowly. Would I recommend it? Maybe. I think you have to be patient with it, to get anything out of it. It was a bit slow for me, and I didn’t warm to the characters, but looking back there is a lot of interesting thought in it, it just only really appears so in retrospect. Tags: A.S. Byatt, book, book review, Fabian, Pottery, Stories, Suffrage, The Children's Book. Bookmark the permalink. Sorry about that – hope the wound isn’t too deep! I agree with your comment about pretension though. I am so glad it is over and I don’t have to read it any more. It needed a good 300 pages editing out of it. I will certainly not be rushing to read Possession or any of the others. Thanks for the warning, Oh Book Guru! Having just finished ‘The Fatal Shore’ by Robert Hughes, which was fascinating, for the most part, but took forever to finish, I have decided that, when I am Prime Minister, there will be a legal limit on books, and nobody will be allowed to publish anything that goes beyond 200 pages and everything will have to be printed in 12 font. 616 pages? It’s just not reasonable! Size 12 font would be a joy – I was getting a headache reading The Children’s Book. Maybe I’m getting old??? Or maybe it was my brain protesting at being forced through so much turgid text.